Peter and Kelli Bronski are the husband-and-wife team behind numerous gluten-free books. The Bronskis have been gluten-free since January 2007, when Pete was de facto diagnosed with celiac disease. They maintain a 100 percent gluten-free home, where every recipe must please the palates of their children, Marin, Charlotte, and Timothy. New York natives, the Bronskis are now based in Colorado, but their blog can be found here. Cooking and sharing meals is something every family should be able to enjoy together—even if one or more family members eats gluten-free. If your household is avoiding gluten, this book will lead the way to recreating your family’s old favorites, and introduce you to a few new ones, too! Alongside such kid-tested and approved recipes, Gluten-Free Family Favorites teaches the ins and outs of a gluten-free diet, including how to maintain a gluten-free kitchen, avoid cross-contamination, reduce the higher grocery bills that can come with a gluten-free diet, and empower children to select and prepare food for themselves. Each recipe includes a full-page color photo, “Kids Can” tips to get kids cooking, and modifications for families avoiding other allergens or eating a vegetarian or vegan diet. With delicious recipes and a wealth of advice, this will be an indispensable addition to your family’s cookbook shelf. Since its original publication in 2009, Artisanal Gluten-Free Cooking has steadily grown in popularity as more and more home cooks have discovered—and enjoyed—the Bronskis’ high-quality (but not too complicated), from-scratch recipes for delicious gluten-free fare. This expanded and updated edition, now four-color throughout, includes 50 all-new photographs, 25 new recipes such as Penne a la Vodka, Bagels, and Red Lentil Dal, and more nods to vegetarian and vegan eaters. As before, recipes draw on cuisines from around the globe—Italian, Indian, and Mexican among them—and include both sweet and savory dishes, from breakfasts, soups, and salads to entrées and desserts. The Bronskis’ unique gluten-free flour blend results in stellar baked goods, including Belgian Waffles, Crepes, Snickerdoodles, Blueberry Pie, and Carrot Cake. Since the advent of sport, athletes have worked to gain an edge on their competition—to look, feel, and perform their best—through both training and nutrition. Today, science is increasingly showing the negative impact that gluten, a protein in wheat, barley, and rye, can have on health. For the estimated 30 million Americans with forms of gluten intolerance, such as celiac disease, this all-too-common protein can cause gastrointestinal trouble, inflammation, muscle fatigue, and mental fog that hinder an active lifestyle and negatively impact athletic performance. The solution: a whole-foods, nutrient-dense gluten-free diet. Others who voluntarily eat gluten-free can also discover an edge they never knew was missing: faster recovery, reduced inflammation, improved digestion, and increased athletic performance. Whether you’ve been diagnosed with gluten intolerance or simply want to get ahead of the competition, this book is for you. Your own gluten-free edge is waiting. Co-written with nutrition therapist and exercise science expert Melissa McLean Jory, MNT with a foreword by Amy Yoder Begley, US Olympian. Visit Melissa’s website, Gluten Free for Good. The wait for an entire cookbook of gluten-free cupcakes is over! 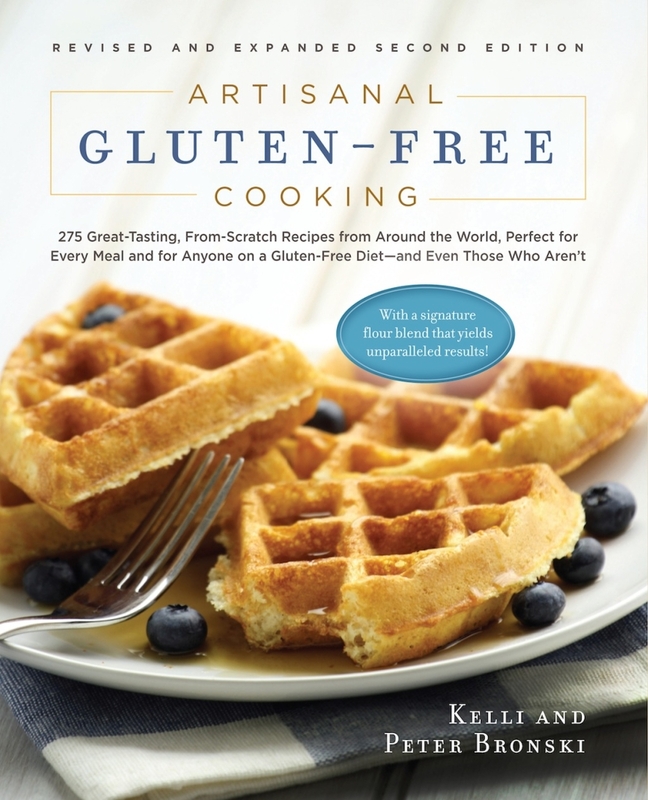 Kelli and Peter Bronski’s Artisanal Gluten-Free Cooking garnered a PW starred review and airtime on The Splendid Table, and within one year of publication has established itself as a category-leading all-purpose gluten-free cookbook. Now the Bronskis bring their accessible but “artisanal” approach to these from-scratch, high-quality homemade cupcakes. The foundation of these recipes is their intensively developed gluten-free flour blend, which enables home cooks to craft bakery-quality confections, from kid-pleasing favorites like Vanilla Cupcakes with Chocolate Frosting or “Peanut Butter Cup” Cakes, to more subtle and surprising treats like Mojito or Poached Pearfection cupcakes. They include tips for adapting the recipes to alternative diets of all kinds, including egg-, dairy-, and refined sugar–free versions. These are cupcakes so good even those who don’t eat gluten-free will love them.